MotoCalc 8: The World's Best Electric Flight Calculator! MotoCalc 8 is the most comprehensive, accurate, versatile, and easy to use RC electric flight power system selection and prediction program for the hobbyist. Download now and try it free for 30 days! Note: Our phone number has changed! Please see our contact page. Fly Electric? MotoCalc Is For You! Choose the right power system for your model and how you want to fly it. Optimize a set-up using the components you have on hand. Predict system and aircraft performance and flight time. Compare predictions for different power system configurations. Share projects and data with other MotoCalc users. MotoCalc will save you time and money by reducing the need for experimentation! MotoCalc works with Windows® 10, 8, 7, Vista, or XP. MotoCalc Tutorial. Our Tutorial Introduction to MotoCalc provides a step-by-step illustrated guide to using MotoCalc. 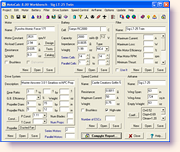 Download the MotoCalc installation program. Run the downloaded program and follow the on-screen instructions to install MotoCalc. Try it for free for up to 30 days. If you are satisfied, click Order a Key or CD in MotoCalc to purchase a registration key or CD. Purchase a MotoCalc CD on-line using our secure order form. Registering your downloaded copy of MotoCalc costs only $39. If you prefer a CD version, there is an additional $10 charge to cover media, shipping, and handling.